AppCleaner or App Cleaner Pro? What’s the difference between 2 popular Mac applications? There are 2 popular removal tools for Mac with almost similar names – AppCleaner and App Cleaner Pro. Although they have completely different interfaces, developers and functionality, they tend to be mixed up by most users. On some well-known download archives, I found user comments about not being able to comprehend the difference between the 2. That has spurred me to write this article comparing the 2 uninstallers, including a comparison table. For those who may not know the above-mentioned applications, I will clarify. Almost every experienced Mac user realizes that removal of an app by just moving its icon to Trash is not enough for complete uninstalling. When you drag and drop a program to the trash bin, its service files still remain on your Mac. Imagine looking for a suitable application to make notes. You download several or dozens of programs from the App Store and try each one to find the most convenient one. Now try to recall how many apps you’ve downloaded and deleted, due to their unsuitability, for the entire session on your computer. If you removed them the regular way, all their support files are still stored on your disk and may occupy gigabytes of hard drive space. That’s why it is important to uninstall software completely or to periodically clear service items. Fortunately, there are special tools that allow you to perform this task easily – AppCleaner or App Cleaner Pro. As you run AppCleaner, you will see a window to which you can drag the application to be deleted. It will find the related items for you and then you press the Delete button. Before deleting, you can carefully study the compiled list of data belonging to the utility to be deleted. If you think that some objects should be left – uncheck them. In addition, AppCleaner has 3 tabs that show already installed applications, widgets and plug-ins in the system. A completely different interface is represented in App Cleaner & Uninstaller Pro. Once you launch it, you see the window with all installed programs on your Mac. By clicking on each program you can preview all the related files in the right section. If you want to uninstall an app completely, just select all its items and click the Remove button. It is also possible to clear only the app’s service files by selecting all the files except Executables. This uninstaller also provides 2 more important features for those who care about keeping their Macbooks or iMacs clean from all debris. In the Extensions tab, you will find user and core system extensions, where you can change or remove login items, launch agents, installations, plugins, widgets and so on. In the Remains tab, you can preview and remove leftovers of old apps, which you have removed, by just moving them to Trash without using uninstalling tools. 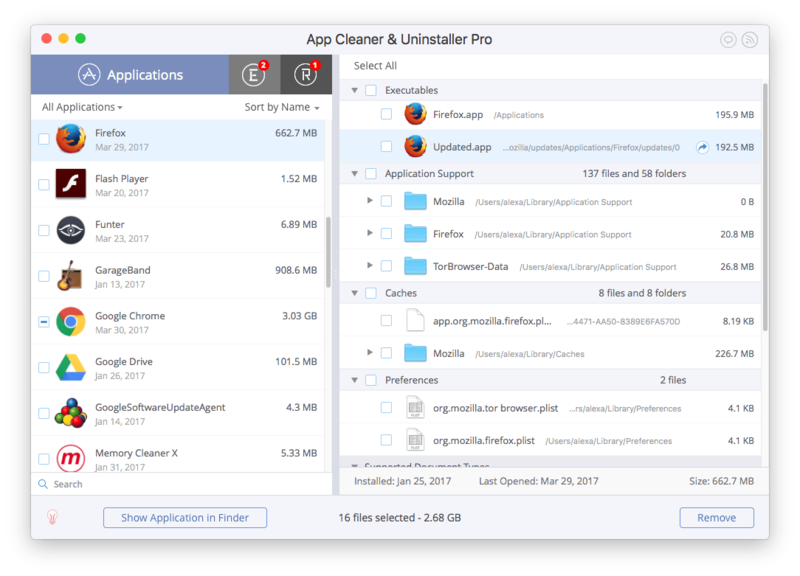 The developers of App Cleaner & Uninstaller Pro say that their tool supports 1000+ apps for complete uninstalling. All that may be chalked up to the list of its pros. I scanned my apps with both programs and checked my Firefox browser for the total size (see above screenshots). 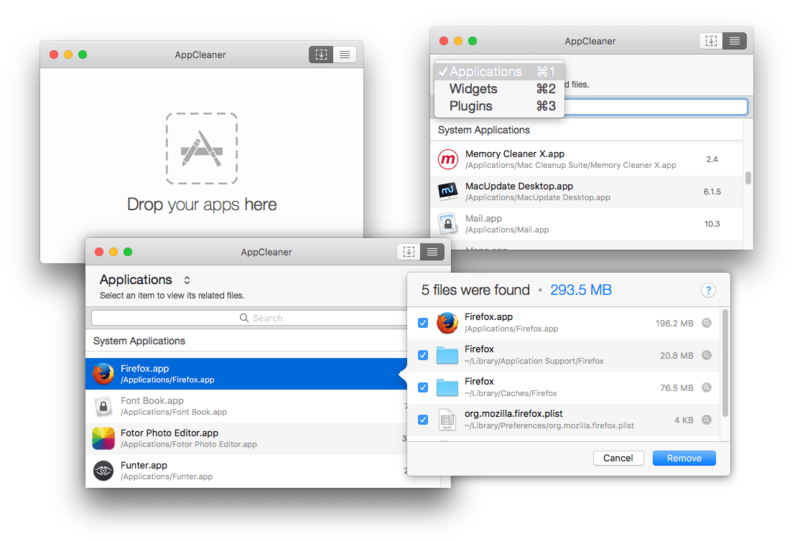 While AppCleaner showed a total size 293.5MB, App Cleaner Pro found far more support files totalling 2.68GB. It is easy to see that the second uninstaller carries out its task more professionally and accurately. AppCleaner is an absolutely free application; however, a free-will donation is welcome. You can download the app from its website. App Cleaner provides a free trial for 3 days with unlimited features. After the trial period, the feature to remove extensions will be locked. 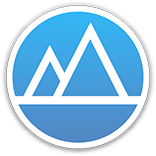 The free version of the app allows you to preview installed apps, remove service files, including broken files and leftovers, preview installed system extensions, and disable unneeded auto-launching programs from running when the system is loading. The cost to unlock all the features is $9.99. AppCleaner is a simple and easy to use application for uninstalling apps. However, it may not find all the support files of the apps. It is free and performs its task well. But it is inferior to App Cleaner Pro in terms of functionality and amount of service files found. App Cleaner Pro supports most App Store applications and doesn’t leave any piece of leftover on your Mac. It is a more convenient and efficient tool due to the possibility of previewing all your installed apps and extensions, and removing them.